Teaching Blog Round Up: Math Stations and Holiday Freebies! 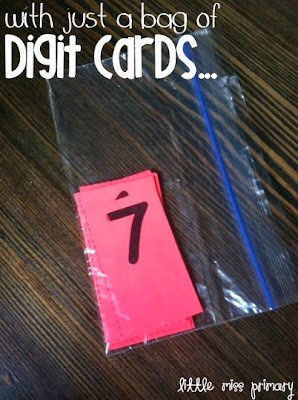 I wanted share a few holiday themed freebies with you today and talk a little about math stations. 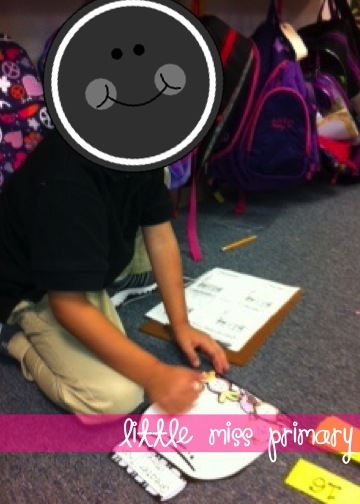 we rotated through math stations everyday--and it was FUN! Classroom blogs, Pinterest, and TeachersPayTeachers were my BEST FRIENDS!!! Seriously, so many of my fun stations were because of you. We had a total of five math stations in the classroom. I loved using the five strands to plan math stations!! 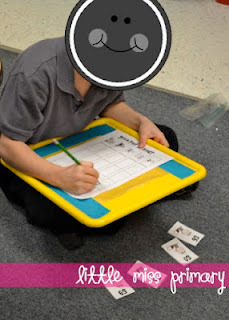 The variety of content kept my kids engaged, plus they were able to review and extend their learning. Score. So here is how it worked: Each station had its own plastic tub and all materials were kept inside. This made organizing and clean up quite easy--though we still had our messy moments. Ha! You can sort of see the blue geometry tub here in the middle while the kiddos are finishing up their recording sheets. We had 40 minutes for stations each day, so we rotated through two stations--sometimes three. Friday's were a "you're responsible for turning in your station work and I'm really going to look at it and I trust you to finish each station" kind of day! I Spy Clocks from Rachelle and Natalie. Number Ordering from Kerri Bordelon. Greater Than/Less Than Candy Jars from Cara Carroll. Again, SO THANKFUL for this community!! I wanted to share a few simple activities that might appear in my stations beginning this time of year. The first is a Halloween themed freebie and the second is a Thanksgiving themed freebie! 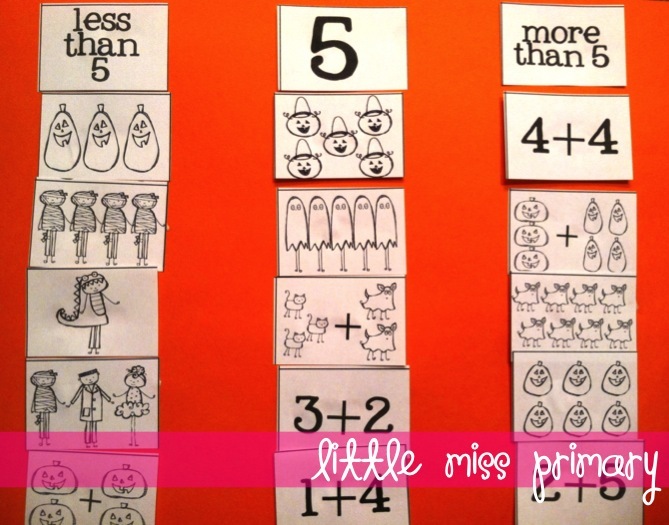 This Halloween number sort focuses on more than/less than/equal to, addition, and counting. And a bonus--they will be working on some fine motor skills while cutting out the pieces! 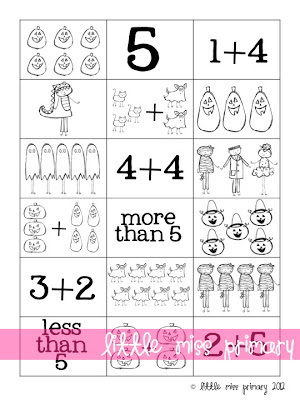 Just click on the picture to download your patterning freebie! Thanks to kmpdoodles for the cute graphics and kevinandamanda.com for the font! Each student (or pair/group) will need one copy of the handout. 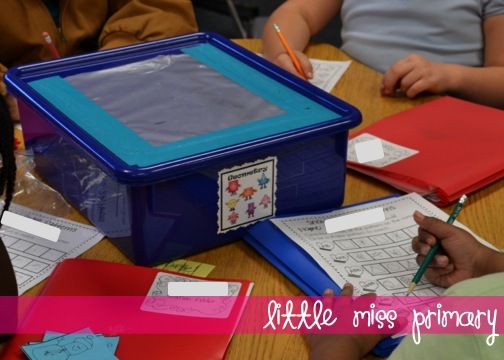 They will cut out each box and use "less than 5," "5," and "more than 5" as their headers on a piece of construction paper. 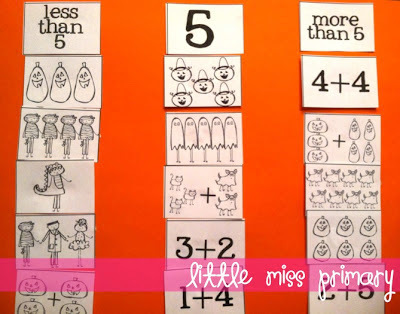 Your kiddos will then sort the rest of the pictures according to whether the answer is more than, less than, or equal to 5! The second freebie (I know it's early--but I loooooove Thanksgiving!) is a patterning freebie! 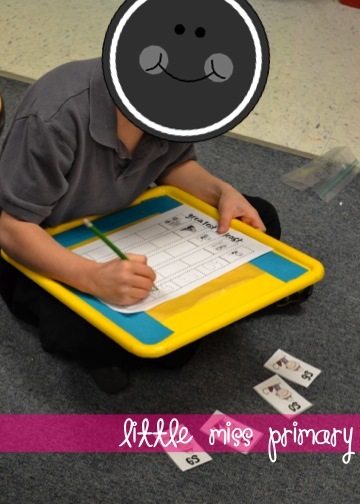 Your kiddos will use the pictures at the bottom to finish the patterns. Again, working on those fine motor skills! 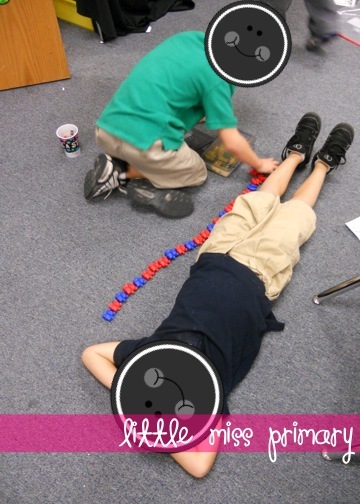 So, that's how I've done math stations. How do you work math stations/centers?? I would love to hear what is working (or hasn't worked!) 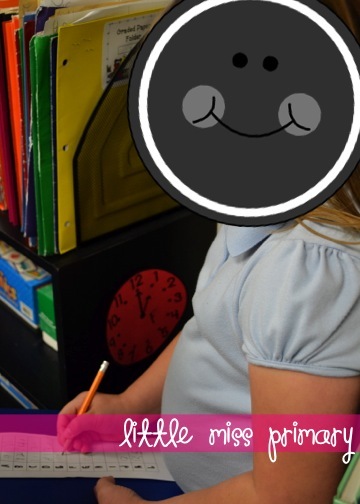 in your classroom! Have a great Wednesday evening! !